A unique pile of more than a thousand seal impressions featuring Greek gods, symbols and erotica has been found in an underground closet carved into the bedrock of the biblical town of Maresha. The seals date to the city’s final and most fruitful incarnation, the Hellenistic period, predating its final devastation. The inscription on one of the seals is from 145 B.C.E., the archaeologists believe. It’s impossible at this point to say when the earliest seal is from, but the latest has to be around 107 B.C.E. because the city was destroyed at that time, the archaeologists suggest. Letter writers in ancient times used seals they hoped would guarantee that nobody but the addressee read their precious papyrus. Or at least, if the seal was broken, the addressee would know that privacy had been violated. What the archaeologists found in Maresha was evidently a collection of papyri that somebody had stored in the ancient equivalent of a safe. The papyri themselves had long since decayed. It need not have been a vast library. “A single papyrus could have up to six seals on it,” explains Ian Stern of Archaeological Seminars Institute and associate of Hebrew Union College. The floor of this “closet” had been heavily plastered, and many of the seal impressions have plaster stuck to them. Given that all were made of unfired clay and are friable in the extreme, we may never know what they show. Cleaning tiny unbaked clay items of the crud of centuries is a painstaking task that will take a very long time. Meanwhile we can say that most of the impressions were only about a centimeter (less than half an inch) in diameter. We can also say that they seem to be almost entirely Greek in type, say Ariel and Stern. The impressions feature portraits of both humans and deities: Castor and Pollux, Athena, Apollo and Aphrodite, symbols such as cornucopia, animals — and erotica, as can be seen in two of the 300 impressions studied so far. A few also sport names or letters in Greek. Whenever it was founded, by the First Temple period in the Iron Age Israeli (the eighth to seventh centuries B.C.E. ), Maresha was Judahite. It appears in the Book of Joshua as being part of the inheritance of the tribe of Judah, among the cities captured by the ancient Israelites: “and Keilah, and Achzib, and Mareshah; nine cities with their villages” Joshua 15:44. Yet another Maresite claim to fame is reportedly being the stamping ground — literally, it seems — of the prophet Micah, who urged his co-religionists to forgo their evil ways, among other things idolatry. Micah, a contemporary of Jerusalem-based Isaiah, is believed to have wailed his warnings between 737 and 696 B.C.E., ahead of Sennacherib’s brutal invasion of Judah in 701 B.C.E. Micah is also said to have foreseen the devastation of Jerusalem. It would take about 150 years from his lifetime for that to happen, courtesy of the Babylonians in 586 B.C.E., but happen it did. The city’s Judahic phase was not to last. Peeved at Judahite provocations, the Babylonian king Nebuchadnezzar II rolled over Solomon’s Temple and Jerusalem, and sent the annoying Judahites into exile. Nature and Edomites abhor a vacuum, it seems. After the Babylonian expulsion of the Jews, Maresha probably stood fallow for some time, then rebounded — peopled chiefly by nomadic Edomites coming up from Transjordan who expanded into southern Israel, reaching from the Negev as far north as Maresha, Stern explains. These were the forefathers of the Idumeans — which is simply “Edomites” in Greek, who had been Hellenized by Alexander the Great. While Alexander was supposed to be religiously quite tolerant, he preferred civilization to be Greek. From the second century B.C.E., the town would be pulled this way and that by the forces vying for control, including the Hasmoneans. Reportedly it was from Maresha that the Hasmoneans embarked on the ultimately ill-fated revolt against the Seleucid Empire. In around 110 B.C.E., at the height of its prosperity, Maresha was conquered by the Hasmonean leader John Hyrcanus, nephew of Judah Maccabee, who reportedly forced the locals to convert. That is also about when people began to abandon the city. Possibly the home and the archive were abandoned then. Ultimately Maresha was leveled in about 40 B.C.E., by invading Parthians. Following that unhappy development, the neighboring Idumean city — called Beit Gabra, or Beit Guvrin, or Eleutheropolis (its Greek name), would become the dominant town in the area. Cleaning the fragile impressions will take a long time, and meanwhile, the archaeologists have some speculation about who owned them. 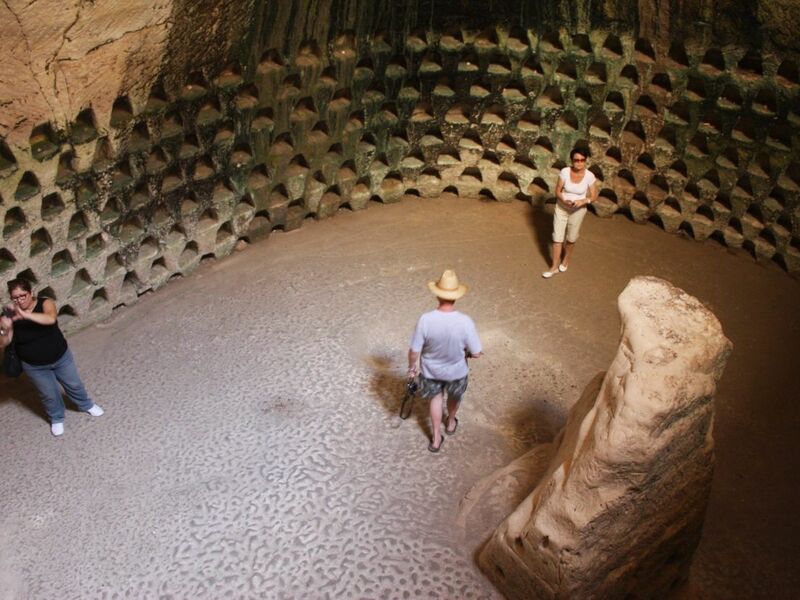 Ariel suspects that the closet-cave hewn from the soft limestone bedrock had belonged to a wealthy estate owner, who like all the elite at the time, inclined toward Hellenistic culture. 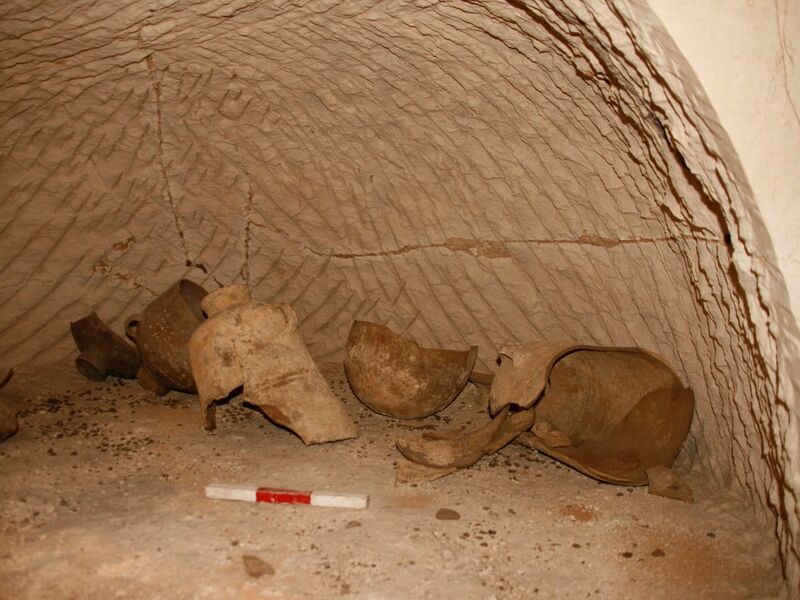 Jewish tombs have been found (elsewhere) from the Hellenistic era, with inscriptions in Greek. “Maresha was limited during the First Temple Period,” says Stern. The city expanded off the tell and into a lower city — which is where the thousands of subterranean complexes were built — only during the Hellenistic period. The famous tunnel system of Maresha was (whatever the legends) quarried out by the people for building materials, says Stern. Later, perhaps when the city was under siege, the quarry caves were connected by underground tunnels. The archive was not unique. 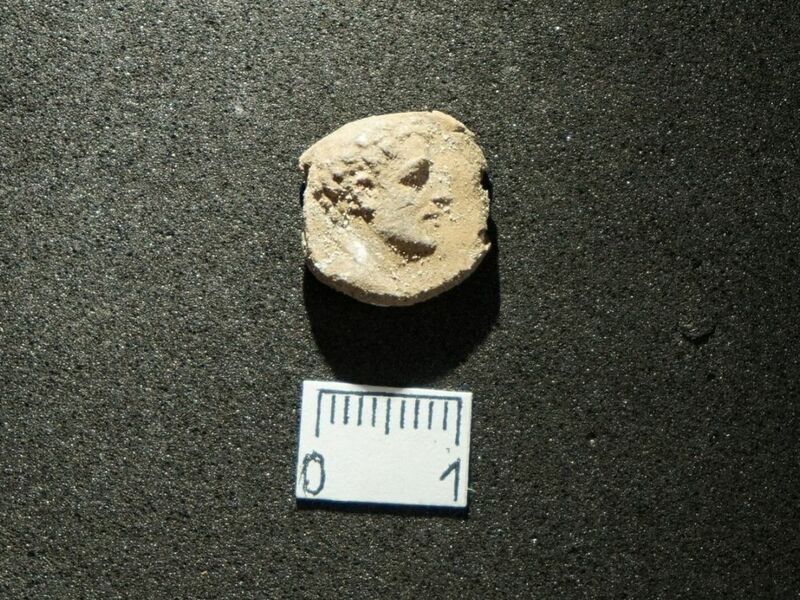 About 30 such have been discovered around the Hellenistic world, Ariel said — but in Israel, it’s only the second to be found — and the first, discovered about 20 years ago in the north of the country at Tel Kedesh, was more closely connected to Phoenician culture. One last note. Archaeological finds at Maresha are almost entirely from the Hellenistic period, says Stern — but there’s a caveat. During their excavation, crawling heroically through the subterranean complex, they discovered seven untouched rooms, and did a quickie survey. They found some Roman-era lamps in there and a casserole dish, and noted that some of the walls had been broken through. It seems that during the Roman period, either people crept into the tunnels and hid there from persecutors for a time. Or they were robbing it and left their casserole dish behind, as robbers do.